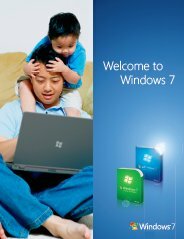 Windows 7 Upgrade Advisor - Are you ready for Windows 7? Download Windows 7 Advisor to check. Requirements, Experiences, Troubleshooting, Help and How-to. Are you planning on installing Windows 7 in your Desktop PC, Laptop/Notebook or Mini Netbook? Make sure you check your PC first, to make sure it can run the operating system. Granted, Windows 7 is wonderfully streamlined in terms of resource management, but it still needs quite a hefty configuration in order to start up. The Microsoft Windows 7 Upgrade Advisor is the best utility that can scan through the hardware configuration of your PC and tell you whether you have enough resources for the Windows 7 upgrade. The utility can be downloaded from the Microsoft website for free. 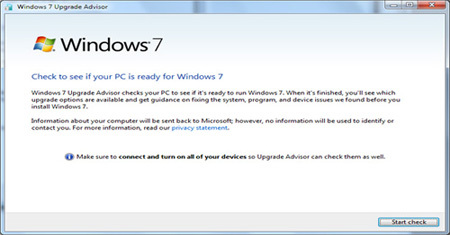 Click here to Download Windows 7 Advisor from the Microsoft website. All right, I have got the setup file. What should be my next step? Before you begin: remember to plug in and turn on whatever hardware you use in your PC on everyday basis. Remember to plug in all the hardware components, even the ones that you connect through USB ports. That includes your USB printers, mouse, external hard drives, scanners, and whatever USB gaming devices you use. I have plugged in all hardware devices. What now? Install the Windows 7 Upgrade Advisor from the setup file that you have downloaded from the Microsoft website. The first thing it will check is, whether you have Microsoft .NET Framework 2.0 installed in your PC (If your PC is running Windows XP, setup will make sure .NET Framework 2.0 is installed.). Without this platform, the Windows Upgrade Advisor cannot work. If you do not have it, the Windows 7 advisor will help you to download it and install it. Once you have installed .NET Framework, scanning of your hardware setup will commence. What will happen when the scan is completed? You will get a report once the scanning is over. The report will include a summary of your present hardware configuration (including the USB devices) and will also contain information on whether your PC is due an upgrade prior to installation of Windows 7. If it says your PC is powerful enough to run Windows 7, then you can go ahead with the installation of the Windows 7 in your PC. Please note that even if your PC is deemed to be powerful enough for Windows 7, it may still give you poor performance while running applications. That's because the Windows 7 Upgrade Advisor tells you to go ahead with the installation if your PC meets the minimum system requirements required by Windows 7. You may still need more resources to run other applications Windows 7 platform. If you're running the Windows 7 Upgrade Advisor inside Remote Desktop or Virtual PC, Windows Aero capability might not be detected properly. What do you think about Windows 7 Upgrade Advisor? Do you have any Windows 7 Upgrade Advisor experiences, ideas, article, story, opinions, errors, problems and tips which you would like to share? Why not take a few moments and Share it with everyone!